For over a week, numerous organizations, businesses small and large, and individuals have been joining in on the rescue and relief efforts for the residents of the city of Houston and its outlying areas. At the last visit to the Red Cross donation page, a red banner announced that the high volume of visitors has overwhelmed the page; I also heard from a (thankfully safe) former high school classmate who lives in Houston that there are about as many volunteers as there are residents—and Houston’s a big town. In today’s divisive sociopolitical climate, this is the only heartening thing about the tragedy. And the same thing goes for animal rescue, pets in particular—all these little rescues local and afar that are joining in with the big dogs to do the same thing. Last week, I visited Wild Blue Animal Rescue and Sanctuary (they rescue only cats) in Colorado Springs, and the day I left, they were making preparations to take in about 20 kitties from the Houston shelters. Here in Long Beach, small rescues are donating and fostering, and a few of the members have gone to the affected areas to help rescue and transport pets to shelters, other rescues and fosters. This is heartening, too, especially to animal lovers and advocates. Your help’s needed, too, whether it’s donating, fostering or actually going down to Houston. Check out these organizations, and give whatever you can—if everyone gives a small donation, it adds up quick. Because they’re underfunded and overextended, the little dogs will be listed first. Live Love Animal Rescue, a Long Beach rescue and advocacy organization, have taken in The Texas Nine: two adult males—a Lab/greyhound mix and a handsome mutt; a young-adult Lab mix; a 4-month-old shepherd/Malinois mix; two young medium-size females—a Boston terrier mix and an Australian shepherd mix; and three adorable doxie-mix puppies, 10 weeks old and all females. The dogs have gotten behavioral assessment and are ready to be fostered. Click on either link above for information. Live Love also thanks Pet Food Express, Fix Long Beach’s Pam Rainsdon,and Angela and the team at The Little Lion Foundation for their role in donating flea meds, toys and dewormers. Feline rescue Helen Sanders CatPAWS has pledged to take three adult cats and four kittens via Best Friends Animal Society. If you want to contribute to these efforts, visit the link. Better yet, enter the Show Us Your Kitties cat calendar contest or vote for your favorite pinup purrer (Hint: Miss Brooks and Duncan are highly deserving of your vote—each vote costs only a dollar). K9 Kismet is a foster-based organization that pulls dogs from open-admission shelters and finds them homes. They, too, had a calendar contest that recently ended, and they’re giving the overage to help the Harvey rescue efforts. 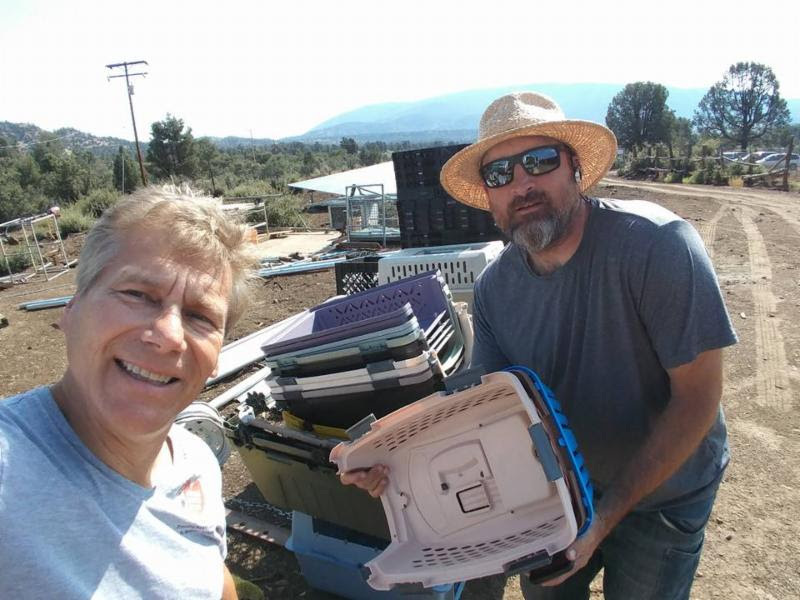 OBOL volunteers leading crates to send to Texas. Photo courtesy of OBOL. Operation Blankets of Love (OBOL) is well known for providing comfort and care items to pets in shelters and ones owned by people in need, advocating for animal welfare and against cruelty, and raising awareness of the need to adopt in order to avoid euthanasia and shelter overcrowding. The organization is working overtime to get supplies to Houston: thousands of pounds of pet food, hundreds of blankets, lots of crates, and articles such as bowls, leashes and toys. It’s going to take weeks and months to reunite pets with their people. Donations are desperately needed and can be made here. Doug Pennington, who won Long Beach Animal Care Services Spirit of Dr. Eslinger Award in 2016 for going above and beyond, is literally doing that now. 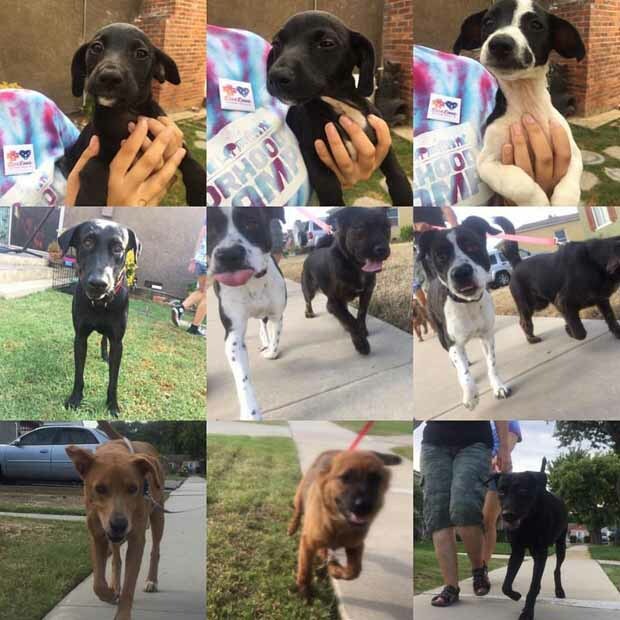 At this writing, Pennington was in San Antonio, Texas, with Wings of Rescue, getting ready to fly 30 dogs and 17 cats impacted by Harvey to new homes in Washington State and Oregon. Photo courtesy of Douglas Pennington. Wings of Rescue is a donation-based charity that flies large numbers of at-risk, healthy pets long distances from high-intake shelters to their network of no-kill shelters throughout the United States and Canada. The organization has its own squadron of volunteer pilots that fly their own planes to help the animals. Since its founding in 2012, the organization has flown 26,000 pets to safety. Their 2017 goal is to fly 10,000 pets with this objective, and with this hurricane, they’ve probably broken the sound barrier. In partnership with the Humane Society of the United States (HSUS), Wings of Rescue has been flying Fluffys and Fidos from flooded areas in the Houston area as well as parts of Louisiana to San Diego; Manassas, Virginia; Colorado Springs, Colorado; Morristown, New Jersey; Portland, Oregon; and Seattle. They’re scheduling five more flights for Monday as of this writing; if they can raise another $25,000, they can add three more flights and fly 300 more pets to safety. You can buy their tickets here. 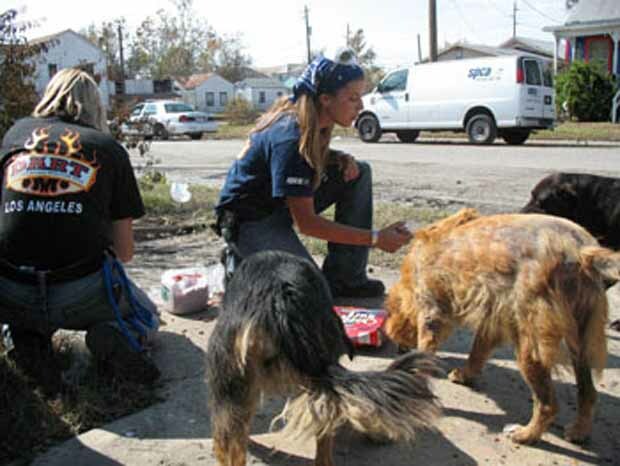 spcaLA’s DART team care for animals during Hurricane Ike in 2008.
spcaLA’s elite Disaster Animal Response Team (DART) deployed to Hurricane Harvey to begin the hard work of caring for the hundreds of frightened, injured and sick animals displaced by the floods and scared. spcaLA is a privately funded rescue with locations in Los Angeles, Hawthorne and in the P. D. Pitchford Companion Animal Village here in Long Beach, where it shares the facility with Long Beach Animal Care Services, our city’s shelter (the two are separate entities). spcaLA’s team of humane officers, veterinary staff and animal caretakers will keep these animals safe, fed and warm so that as the waters recede, they may be reunited with their families. The team will also provide rescue and relief for animals still trapped in the region, as requested by authorities on the ground. To support their efforts responding to Hurricane Harvey and future disasters, please donate here. 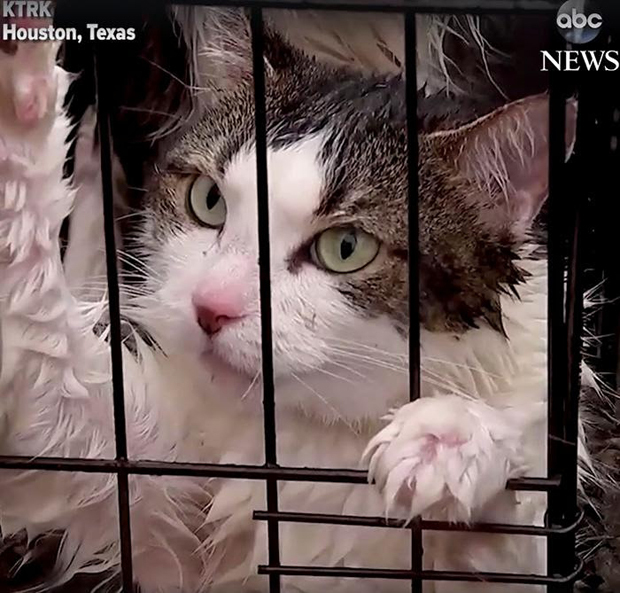 Responding to a resident report, the HSUS Animal Rescue Team (ART) returns successfully with two cats who had been trapped in a home along Green Willow Street following Hurricane Harvey. The team rescues any animals they come across, including swift-water rescue. This work also helps local animal shelters coordinate their response options with HSUS Emergency Placement Partners. Photo by Anthony Rathbun, Humane Society of The United States via AP Images. The Humane Society of the United States assists anything that flies, swims, walks on four (or three) legs, roots in the dirt, gallops in a canyon, or curls up on a bed. They’ve shut down puppy mills, helped to protect and educate about wildlife, and fought cruelty and neglect. They were there in force during Hurricane Katrina, and now their emergency responders are rescuing pets stranded in floodwaters and working with local agencies and nonprofits to move adoptable animals out of the immediate area to make room for an influx of pets left homeless by storm damage and severe flooding. HSUS teams are focused on transport of animals from Texas to other states and are assessing additional areas to determine which resources to deploy. They’re working with Wings of Rescue and shelters across the country in their efforts to fly pets out of the area. And yes, it costs money. Visit the link above to donate. 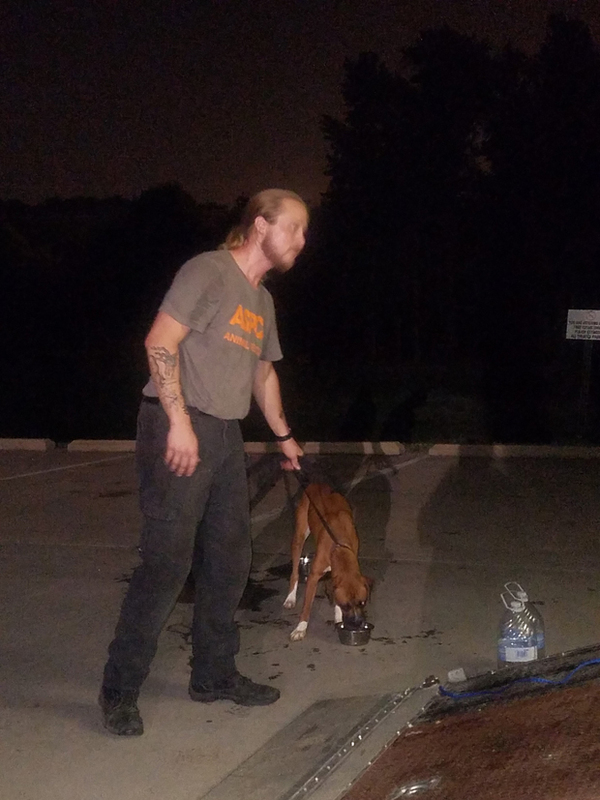 An ASPCA responder walks and provides water for one of 41 dogs during one of the stops as the ASPCA transport vehicle makes its way to the ASPCA Adoption Center and Connecticut Humane Society. These shelter dogs were initially evacuated from Corpus Christi, Texas, before Hurricane Harvey devastated the area. They were awaiting transport to shelters and rescue groups and will become available for adoption. Photo courtesy of ASPCA. The American Society for the Prevention of Cruelty to Animals (ASPCA) is the nation’s most venerable animal-advocacy organization. The organization has arranged transports for the Long Beach shelter’s pets to other areas of the country where there’s a call for adoption and has for decades assisted with rescue, legislation and placement both locally and nationally. And now, they’re working shoulder to haunch with all the volunteers in Houston and the surrounding areas, assisting in recovery efforts in the aftermath of Hurricane Harvey. They’re transporting animals and supplies out of some of the hardest-hit regions, helping with sheltering efforts, and providing other resources to the affected communities. Visit the link to donate—100 percent of donations will go to the ASPCA’s Field Investigation and Response Fund. This fund is used to support all of the ASPCA’s life-saving efforts for animals in disaster and cruelty situations. The Best Friends Rescue and Reunite Center is busy housing displaced pets. Photo courtesy of Best Friends Animal Society. Best Friends Animal Society has regional centers in New York City, Los Angeles, Atlanta and Salt Lake City. It also operates the nation’s largest no-kill sanctuary for companion animals. They’re working hard to assist the rescue effort by putting in place protocols and procedures with key learnings from its rescue-and-reunite efforts during Hurricane Katrina. They’re now housing hundreds of animals and are coordinated with other animal organizations such as the ones mentioned above to help with fostering displaced and shelter pets until they’re reunited with their humans. Please donate on the link above—this helps not only the organization but all the little guys working with them. Stray Cat Alliance Founder Christi Metropole states that cats are overwhelming shelters in Houston. Photo courtesy of Stray Cat Alliance. Volunteer If you’re willing to travel, help is sorely needed to care for the many animals that are overwhelming the Houston-area shelters. Metropole said that they’re especially overwhelmed with cats, and in fact, she’s out there now helping. She recommends accessing Volunteer Houston, which has launched a Virtual Volunteer Reception Center to aid nonprofits and agencies in finding and deploying people to hard-hit areas. Supplies are needed, but because of the difficulties with transportation and delivery, it’s better to donate the funds to buy supplies. Some organizations have an Amazon Wish Lists set up for this purpose—search for them when you visit Amazon. Foster If you live in one of the areas that has accepted animals from the Houston area, you can help by fostering shelter and rescue animals because, as stated, they’re overwhelmed with taking in rescued pets. Check out Live Love and Helen Sanders CatPAWS (see links in their sections), and keep an eye out for others. Donate All shelters and rescues need additional funds at this time (including Stray Cat Alliance). Please be careful to donate to legitimate nonprofit organizations! There are people taking advantage of the disaster and scamming the public for donations—be assured that all the organizations mentioned in the article are legit. If you know of any I’ve missed, please list them in the comments area either on the homepage or Facebook page. Thanks so much, and all best thoughts to all the pets and people in Houston.